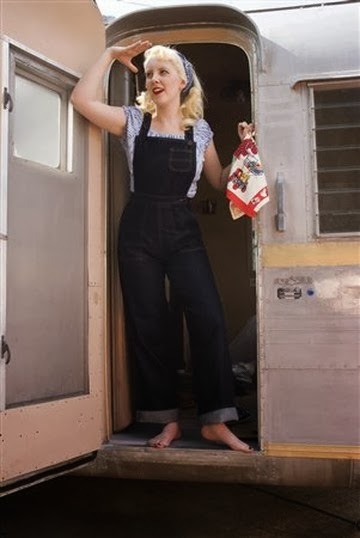 Porcelina's World: Outfit: Rosie the Riveter Style! Outfit: Rosie the Riveter Style! The other week on my day off, there was serious work to be done around the house, so I dressed for it. The dungarees were borrowed off a family member once and never returned (oops! ), the Western shirt is from a thrift store in Texas ($1) and the bandana was from New Look. Anyway, I'm pleased to report that we fixed the central heating! Well, my Baby did, he's very clever, I just held the torch and made sure he re-covered the live wires properly, because I'm a bit paranoid when it comes to DIY involving electricity, gas or water. The dungaree pockets came in handy, I had room to pop a torch and pair of pliers in the top pocket, and later when I was cleaning there was room other bits and pieces. I then made parsnip soup for lunch, it was delicious. Fancy being as chic yet practical as Rosie? Here are some outfit ideas for you, all from Freddies of Pinewood. 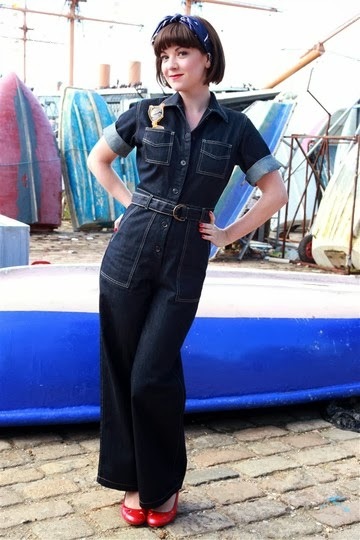 First up, the 'Grease Monkey' jumpsuit, £80. Then the 'Dungaree Dolls' dungarees, £60. And finally, the 'Home Companion' dungarees, £65. Do you have a pair of dungarees? What do you wear for work around the house?? I also forgot to mention that I'm joining in on Friday's 'Passion for Fashion' blogger link up, hosted by Rachel the Hat and Lena B. Every Friday they're linking to fashion bloggers, and pinning their favourites to their Pinterest board here. 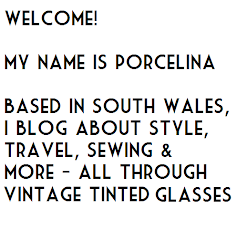 Please go and visit their pages and have a look at some of the wonderful fashion blogs on offer! Real nice combi :-) I like the style! Thank you! I've just checked out your blog, such cute photos! I love the blogosphere for fashion inspiration. Love this look... and so happy to hear it was also practical! lol Pinning this look to my favorites! Thanks for linking up for Passion For Fashion! It's quite a fun thing to do on a Friday, this Passion for Fashion! 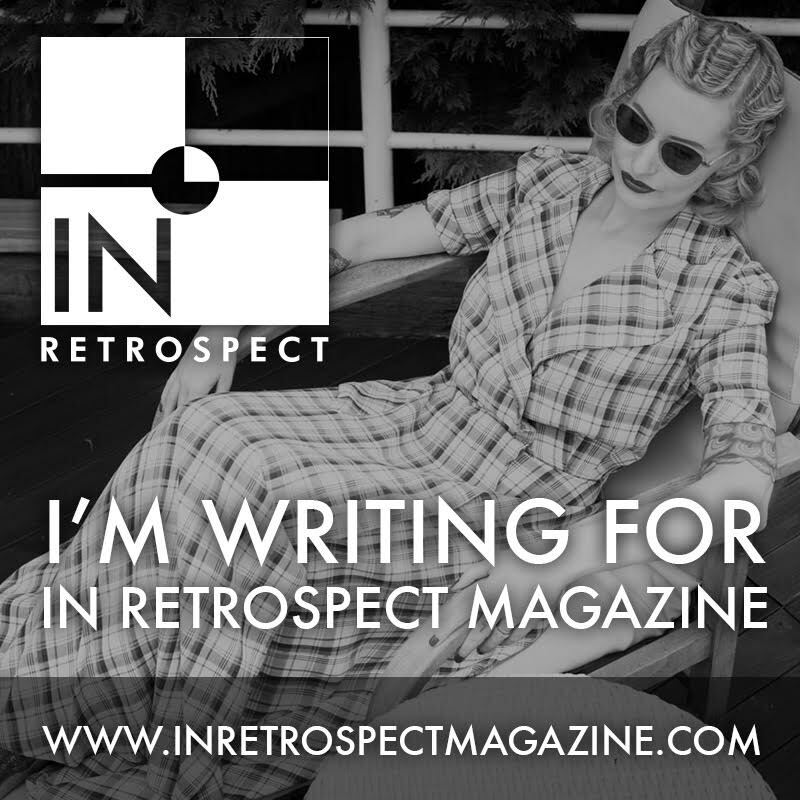 Love your blog, it's good to pass inspiration along. 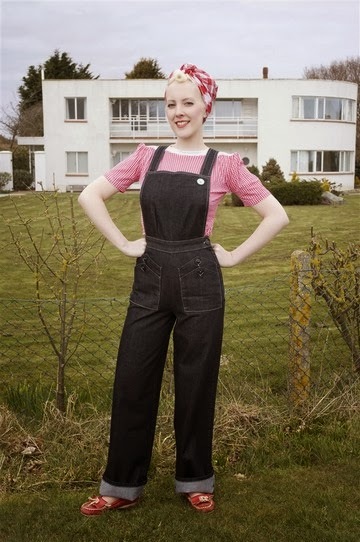 I have multiple pairs of dungarees and love them, but we call them overalls here :) your take on Rosie the Riveter is spot on! I don't have a pair of overalls, but longing for a pair from Freddie's, I do love their coverall inspired grease monkey though quite a bit! They're rather fabulous aren't they, the Freddies ones? I'm tempted! Oh the good ol' days! Very cool. Thanks for stopping by! I found your blog too through the Passion for Fashion, a great idea! You look smashing! Very, very Rosie approved and like you're ready to tackle any job that calls for a little elbow grease in perfect 1940s causal attire style. Have a terrific weekend, dear gal! 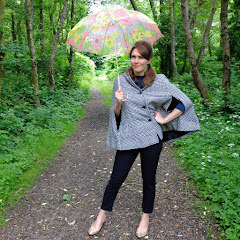 I did feel quite capable in this outfit, but there wasn't much else on the DIY list that day so I had to stop! That outfit looks really cute on you. I look terrible in casualwear. :-( I'm a born suit wearer!